Lawrence Free State 40, Shawnee Mission Northwest 14 – This game played out very similar to the first meeting this season. Northwest jumped out to a 14-0 lead before Free State scored the game’s final 40 points. The Firebirds and Cougars were tied at 14 at halftime and Joe Dineen connected with Khadre Lane on a pair of touchdown passes in the second half to pull away. SM Northwest led Free State 3-0 at halftime in the earlier meeting this season, before the Firebirds won 20-3. Olathe North 14, Blue Valley Northwest 3 – Venus Triplett scored on a 21-yard touchdown run late in the first quarter and Olathe North never looked back in a 14-3 win over No. 5 Blue Valley Northwest. The Eagles rode their defense into the second round as neither team scored in the second half. North took a 14-3 lead into halftime after Cole Murphy hit Josh Moore on a 41-yard touchdown pass. Olathe East 19, Gardner-Edgerton 7 – Olathe East shut down the high-scoring Trailblazer offense and advanced to the state quarterfinals for the fourth consecutive season with a 19-7 win. The Hawks led 10-7 at halftime after Chris Diddle hit a 20-yard field goal. That lead stood until late in the fourth quarter when Jalen Branson scored from five yards out to extend the Olathe East lead to 17-7. The Hawks would threaten again but Gardner-Edgerton came up with a goal-line stand to prolong their chances. Gardner-Edgerton quarterback Jared Hobby was then pressured and stepped out of the end zone for a safety to give the Hawks the final margin. 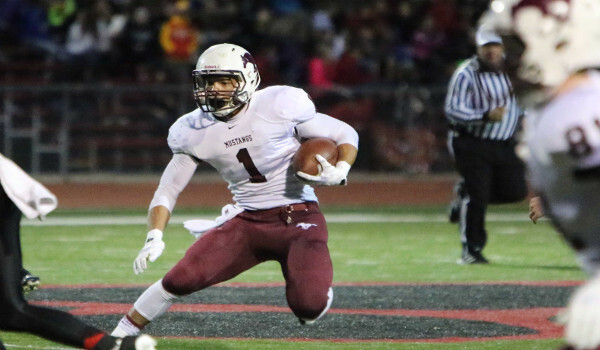 Traevohn Wrench rushed for 129 yards on 26 carries in his final high school game. Shawnee Mission East 36, Leavenworth 14 – SM East set a school record for wins in a season with their ninth as the Lancers beat Leavenworth. SM East built a 12-0 lead only to see the Pioneers go out in front 14-12 behind Jason Randall. The Lancers would score the final 24 points of the game to advance. Derby 56, Wichita North 7 – As expected, Derby had little trouble in getting past the 1-8 Redskins. Derby led 56-0 at halftime and a running clock was used in the second half. Derby defeated Wichita North 70-7 in the first round of the playoffs last season. Manhattan 60, Maize 59 (5OT) – Yes, you read that right. Maize led this game 24-7 until mid-way through the fourth quarter before Manhattan scored on a Kellen Myers touchdown run and recovered the ensuing onside kick. Myers scored again shortly after to pull the Indians within 24-21. Jose Trujillo kicked a 27-yard field goal with 1:48 remaining to tie the game at 24. After Maize quarterback Connor Lungwitz was intercepted late, Trujillo came up just short on a 57-yard field goal attempt as time expired in regulation. The overtimes began. The two teams traded touchdowns seemingly with ease. Lungwitz threw four touchdown passes in the overtimes, while Mahattan continued to grind the ball on the ground for the most part with Ethan Fabrizius scoring three times. In the fifth overtime, Maize struck first as Lungwitz hit Kaven Jobe for their fifth touchdown connection of the night. Manhattan answered on a Henry Bieber run and the Indians lined up in the swinging gate. Bieber took the snap and rushed toward the left side of the end zone to end the madness. Wichita Heights 55, Topeka High 48 – Wichita Heights built a 19-0 lead only to see Topeka storm back to lead 20-19. Heights would respond with two scores to lead 34-20 in the third quarter. The Trojans pulled within 34-27 on a DaMaCias Nielson touchdown run, but Curtis Whitten returned the ensuing kickoff 98 yards for a score to put Heights back up two scores. The Falcons took control from there and led by as much as 55-32 before Topeka scored twice later in the fourth quarter. Garden City 40, Wichita Northwest 36 – The Buffaloes and Grizzlies traded touchdowns in the final 2:22 seconds in a wild shootout won by Garden City. Northwest scored on an Erin Gaither touchdown pass with 2:22 left to take a 36-33 lead. But Greyson Tempel and Garden City would not be denied as Tempel hit Caleb Tramp on a 27-yard touchdown pass with :50 seconds remaining. The Buffaloes then intercepted Gaither at the 10-yard line to secure the win. Mill Valley 38, St. Thomas Aquinas 6 – Mill Valley answered the critics and solidified their spot as a top five team by dominating Aquinas 38-6. The Jaguars built a 24-3 lead behind two Logan Koch touchdown runs. Koch added a two touchdown passes in the second half to move Mill Valley into the second round for the first time since 2008; their only other playoff victory. Blue Valley 42, Shawnee Heights 14 – Chance Nelson rushed for three first-half touchdowns as Blue Valley made quick work of the T-Birds. Cale Reber returned a fumble for a score late in the second quarter to give the Tigers a 28-0 lead at the intermission. Nelson caught one of two Logan Brettell touchdown passes in the second half. Nelson finished with 173 yards on the ground and three scores. Blue Valley West 42, Topeka Seaman 6 – Blue Valley West cruised past Seaman 42-0 on Thursday night to advance into the second round. Ryan Ralston rushed for 130 yards and passed for 130 more in the win. Grant Garcia added 90 yards on the ground for the Jaguars. Bishop Miege 52, Lansing 12 – Bishop Miege rolled into the state quarterfinals with a 40-point win over Lansing. The Stags led 14-0 after one quarter and 38-0 at halftime before starting to mix in some underclassemen. Kicker Collin Carter drilled a 50-yard field goal in the first half and Michael Murphy returned a punt 52 yards for another scores before halftime. Bishop Carroll 70, Newton 13 – Top-ranked Bishop Carroll led Newton 21-13 in the first half before stepping on the accelerator for 49 consecutive points to win going away. Colton Howell passed for more than 250 yards and four touchdowns in the win. Salina South 56, Wichita West 15 – Salina South dominated Wichita West in advancing to a quarterfinal showdown at Bishop Carroll. Mike Jones rushed for 250 yards and four touchdowns to lead the Cougars. Aaron Mar returned an interception 20 yards for a touchdown that extended the Cougars’ lead to 28-7. Kapaun Mt. Carmel 55, Liberal 40 – Kapaun outscored Liberal and moved into the quarterfinals of the state playoffs where the Crusaders ended their last playoff run two years ago. Kapaun built a 55-22 lead in the fourth quarter only to see Liberal’s relentless offense score 18 points to make the game look more respectable. Salina Central 48, Andover 12 – Salina Central ended Andover’s story-book undefeated season in dominating fashion with a 48-12 win. Malik Veal rushed for 230 yards and four touchdowns as the Mustangs evened their record at 5-5. The Trojans trailed only 21-12 at halftime, but Central responded with 21 points in the third quarter to pull away. Centralia 56, Oskaloosa 8 – Centralia rolled to a dominating first-round win over the Bears. The Panthers led 29-0 at the end of the first quarter and 50-0 at halftime. The Panthers will travel to Olpe in the second round of the 2-1A playoffs. Olpe 21, Wabuansee 13 – Early in the game it seemed as if offenses would dominate. Olpe’s opening drive resulted in a short Issac Hall touchdown run, but the Chargers responded right away with a 65-yard scoring run by Ethan Miller. Wabaunsee led 13-7 at halftime and carried that lead until the first play of the fourth quarter when Andrew Burenheide scored from 40 yards to give the Eagles a 14-13 lead. After a Wabaunsee turnover, Bo Krueger scored from a yard out to provide the 21-13 margin. Troy 26, McLouth 14 – Troy picked up its first playoff win since 2008 with a 26-14 win over McLouth. Tristan Speer rushed for two first-half touchdowns and Derek Franken added another score to help the Trojans build a 20-0 lead after three quarters. Lyndon 49, Northern Heights 44 – Last Thursday, Lyndon defeated Northern Heights 36-0. On Friday, the Wildcats and the Tigers exchanged the lead six times before Lyndon held on for the five-point win. Whenever Lyndon seemed to seize control of the game Northern Heights would answer. The Tigers held leads of 21-12, 28-20, and 35-28 at halftime, but each time Lyndon would extend the lead right back. Just before halftime, Northern Heights tied the game at 28 on a Donovan Read touchdown, by Lyndon would answer right back scoring with less than a minute in the half to lead 35-28. The Wildcats took a 36-35 lead on Lyndon in the third quarter when Tucker Litke connected with James Johnson in the end zone and Read added the two-point conversion. But again, Lyndon scored on their next offense play on a 74-yard touchdown run. Read rushed for nearly 300 yards and scored five times, while Lyndon’s Josh Owens rushed for 215 yards and two scores. Lyndon once again played without injured quarterback Joe Walsh as Gage Brecheisen rushed for three scores and threw a touchdown pass. La Crosse 41, Plainville 14 – Plainville battled La Crosse early and took an 8-6 lead in the first quarter, but the Leopards eventually pulled away for a 41-14 win. La Crosse led 26-14 at halftime and scored twice more in the third quarter. The Leopards defeated the Cardinals for the second time this season, having won 40-8 back in Week 4. Oakley 42, Elkhart 7 – Oakley turned in another impressive defense performance in holding Elkhart’s blur offense to only seven points in a 42-7 win. In trying to keep Elkhart’s offense off the field, Oakley scored on two ten-play drives and an 18-play drive in the first half to take a 20-7 lead. Key Keller rushed for nearly 100 yards and two touchdowns in the first half, while Darius Herl added 76 yards and a score. Keller added another long touchdown run in the third quarter as Oakley put the game away. Smith Center 47, Sterling 0 – The Smith Center Redmen ensured there would be no first-round upset by the Black Bears again this season. Smith Center built a 27-0 halftime lead and cruised to the shutout victory. Clint Rogers led the Redmen with a 170 yards rushing, while Nick Lehmkuhl score four touchdowns. Meade 49, Oberlin-Decatur Co. 14 – Jett Little scored on a 9-yard touchdown run with under a minute to go in the first half to give Meade a 21-6 lead at the break. The Buffs would tack on two more scores in the third quarter to pull away. Little would finish with 163 rushing yards and four touchdowns on 23 carries. Morgan Olvera rushed for 149 yards and two scores.